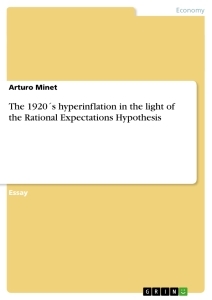 Can the REH explain the end of hyperinflation? After the First World War, Europe had lost its unrivalled economic hegemony over the rest of the world. The very fundament of the world economy, which supposedly had given stability over all the years, namely the gold standard, had practically disappeared. Except for the US Dollar, major currencies were no more backed by gold. During the years of 1914 - 1918, the European great powers had to give up the gold standard to be able to finance the cost of war. This was done mostly by printing large sums of money and by uncontrolled borrowing. The reluctance of the governments to levy higher taxes made short- and long-term debt enormous. After the Great War public expenditure rose even more in most countries due to the reparation and reconstruction costs. The unavoidable consequence (in absence of a restrictive monetary policy) was inflation. This essay is going to describe what happened to those states which experienced hyperinflation and how the abrupt end of it can be explained in terms of the Rational Expectations Hypothesis (REH). Many authors have tried to figure out whether the explanatory value of the REH is better than the one of the adaptive expectations model for micro- and macroeconomic issues. Papers from Ray, C. F. (1993) or Lovell, M.C. (1986) suggest that there is still not enough evidence for the REH to be applied without testing it first against alternative model specifications. Nevertheless, we are going to focus ourselves on the papers by Sargent (1982) and Wicker (1986). Both deal with the sudden end of hyperinflation in Austria, Germany, Hungary and Poland and are very good examples of the debate in the literature on the REH. The common main causes for hyperinflation were the high budget deficits and the unrestrained printing of money to finance them. Moreover country specific features contributed to the spectacular inflation rates in the early 1920’s. Austria and Hungary, as well as Poland saw themselves confronted with the challenges resulting from new national boarders. Huge losses in population, land and power as well as new trade barriers between industries that were once run under a common dominion were propitious conditions for political turmoil and supply shortfalls, especially in food. In order to relief hunger and unemployment the governments made heavy use of central bank borrowing which was financed by treasury bills. In Hungary and Germany, loans given to private agents could be considered as “transfer payments”, as the nominal interest rate didn’t keep pace with inflation by any means. As a result of the factors mentioned, ‘high-powered’ money (notes and demand deposit obligations of the respective central banks) increased rapidly. Furthermore, Austria, Hungary and Germany, as war losers, had to face uncertain amounts of reparation payments. Time lags between the levying and the collection of nominal assessed taxes made financing the public debt even more difficult. Once the typical symptoms of inflation were palpable, (rapid devaluation of the domestic currency, high velocity of money circulation, rise in domestic prices) people began to “flee” from the depreciating currencies, aggravating the situation even more. Although there was a period of recovery from inflation between 1920 and 1922, hyperinflation seemed to be unstoppable in most regions by the end of 1922. The more astonishing it was that all economies had stabilized almost parallel after 1924. Before we start to explain the different points of view of the unexpected end of hyperinflation, we should briefly review the definition of the REH, advocated in our case by Thomas J. Sargent. The theory of rational expectations was first proposed by John F. Muth in 1961 to assess how economic agents forecast future events. Applied to our macroeconomic issue, it states that future rates of inflation are conditioned by agents’ perceptions of long-term government fiscal and monetary policies. This means, that a change in government strategy (e.g. restrictive fiscal policy) is followed by a perfect adaptation of the economic individuals in terms of consumption rates, investment rates etc. Thus, the trade-off between the inflation rate and the unemployment rate (graphically illustrated by the Phillips curve ) is offset, rather than underpinned as in the case of adaptive expectations, where agents form future expectations based on past values. Austria was the first country to stabilize in late August 1922 after the Council of the League of Nations decided to negotiate the reconstruction of the Austrian financial system. In return to the reaffirmation of sovereignty, the clarification of reparation payments and the international loan, the Austrian government had to install a new independent central bank, stop running large deficits and credibly bind itself not to finance deficit with unbacked central bank borrowings any more. A commissioner of the League of Nations supervised the fulfilment of these commitments. The central bank was obliged to cover its note issues with gold, foreign assets and commercial bills with the final goal of convertibility into gold. A balanced budget was achieved by cutting drastically expenditure on government employees, by raising taxes that could be effectively collected and by higher prices on government-sold goods and services. In addition a new currency unit was introduced. For Sargent, the fact that prices stopped soaring despite the increase in high-powered money and notes, violating the quantity theory, is a proof for the rational expectations hypothesis. His arguments rely on the distinction between “unbacked” central bank liabilities and those backed by gold, foreign assets, commercial bills and the binding promise of the government to collect enough taxes in the future. He argues that the sole announcement of the government to restrict its fiscal and monetary policies under extern surveillance led to an immediate stabilization after August 1922. Hence he holds for true that a radical change in the policy regime, convincing the majority of the affected population, is sufficient to eradicate inflation. Originally proposed by John F. Muth (1961) and later developed by Robert E. Lucas Jr.